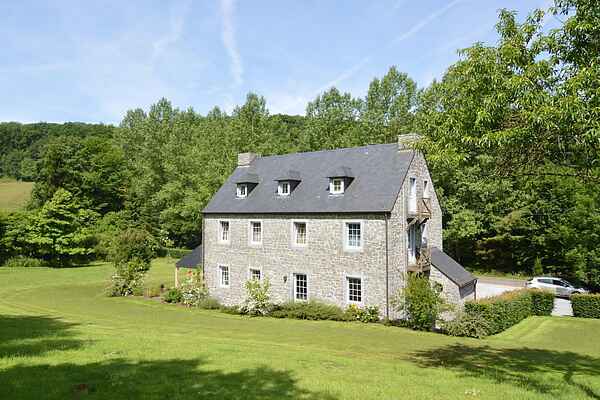 This holiday home is a nice house with an attractive interior, nearby the tourist village of Maredsous, which is famous for its Abbey and the Maredsous beer. This holiday location is great if you're looking for peace and quiet, relaxing and some interesting activities nearby. The house has a peaceful location, in the middle of the woods and is surrounded by a large lawn. The living room with fireplace has lots of character and is a lovely place to sit and chat in the evenings while you're enjoying a drink and a bite to eat. The living room is adjacent to the kitchen and dining area, which works particularly well for larger groups. The patio is partially covered, providing you with a cool spot on hot days. The grounds lead straight down to the 'Ravel' walkway. From here, you can walk to the Abbey of Maredsous, the Ferme de Falaën castle and the ruins of Montaigle. You could also take the car and visit the gardens of Annevoie or the town of Dinant with its famous Citadel.